1) running belt and/or the running deck are worn. (85% of cases). 2) running belt or the drive belt is too tighten, think about this especially if you have recently adjusted. (8% of cases). 3) motor lost torque or is demagnetized. (5% of cases). Under these conditions, do not attempt to operate the treadmill until you understand exactly where the problem originates and solve it. You may otherwise damage other components thus increasing the cost of recovery. normally it is easy to identify if the deck is worn out. The table is covered with a perfectly smooth thin layer. If the layer is worn out or there are hollows, bumps or actual cracks, deck must be replaced. You should use a perfectly straight iron bar in order to check whether the table surface is flat as some low lying areas may not be visible to the naked eye. In some treadmills it’s possible to turn the deck upside down. This is common for professional gym equipment. Sometimes unsuitable lubricants and wax leave residues on the table, which must be removed. If you can avoid degreasers and aggressive products. It is not at all easy to identify if a belt is worn or not. Often the mere age of belt (regardless of usage) will make it unsuitable! It goes without saying, you should replace the belt if it shows cracks, tears or holes in the texture below. But often you should replace it even though the texture and the top surface looks in good condition. To check the degree of worn of the belt is necessary to assess the absorption (amperage) DC or AC depending on the treadmill. Solely looking at the belt or evaluating its feeling is unreliable. Unfortunately many service engineers neglect this aspect, because they don’t have the appropriate instruments to measure the absorption. It is difficult to measure the output current from the PWM controller. That’s because of the particular type of treadmill speed adjustment system (see other articles on our blog). If you are not able to take the current measurement, consider as general rule that if the treadmill works fine when no one and the problems start when a person gets on the belt, the belt is almost certainly to be replaced. Belts older than 5 years are to be replaced. This is especially true for some brands of sports equipment, such as Proform, Weslo, Nordic Track, Domyos, and in general for all treadmills assembled with components marked Greenmaster, GMD or Icon. Those manufacturers also produce as OEM for several brands. They use a basic economic belt, which often presents over time this kind of problem. Very thick belts (for example the so-called "orthopedic", over 2 mm thickness) tend to give more problems than standard belts. Another type of test that can be done without special equipment is the tilt test. Set the treadmill at maximum incline and walk at 4 km/h. If the treadmill operates normally at high speed, and problems start if you lover, that’s symptom that you need to replace the belt. In fact the gravity effect counteracts the increased friction factor of the belt. Note that sometimes bad belts still pass this test. If you have adjusted the running belt or the drive belt recently, double check. On the treadmill, tight doesn't mean any better. You must be able to lift the belt in the middle (with the treadmill off) being able to pass a hand underneath without forcing. If too much tighten the belt gives problems, but make also sure you haven't created a dangerous/slippery situation. Check the instructions in this blog to tighten properly running belt and drive belt. It should be possible to rotate 90 degrees the drive belt / motor belt (with the power off) effortlessly by hands. Avoid it to be too tighten. Check the instructions in this blog for proper tension. New belts grip easily on the roller and don’t slip, thanks to their elasticity, so they need less tension. With a new belt, you can save much more costly repairs. You also reduce the electrical consumption of the treadmill, so it pays out. After many years of use, the engine may need a new pair of brushes. Removing the old brushes you can see if they wear. In that case you can buy a new set. Unfortunately sometimes the damage to the brushes is due to irregularity of the collector. However given the limited cost you can try to replace the brushes. If after some usage you notice an irregular consumption even of the new pair purchased, you will need to replace the motor. The demagnetization of the engine is not common but it is fairly easy to diagnose. This happens more often on the engines marked ICON or MEGA MOTOR, and on motors with lower than 180V rated voltage. To test if the engine is demagnetized, dismount it. After removing the bolts and brushes holder, lift the engine cover and check whether the internal magnets attract metal objects with force. If they do, the magnets are intact, otherwise the motor must be replaced. Other engine damages are due to breaks or short circuits in the armature filaments, usually caused by overheating. It is difficult to determine such situations without the use of special laboratory instrumentation. - if you open the motor and see "debris" of plastic on the armature. All these symptoms indicate that the engine was overheating up to melt the resin insulation which insulates the individual filaments. In these cases, the engine needs to be replaced, but it should also be paid attention to proper maintenance to prevent the new engine from being damaged. It is one of the rarest cases. In most cases, the engineer will replace the controller but won't solve the problem which is more likely in the belt. Normally, to see if a controller is good, you can perform a simple test. The controllers have a current limiter that will automatically lower the power to prevent a short circuit when it finds something abnormal. 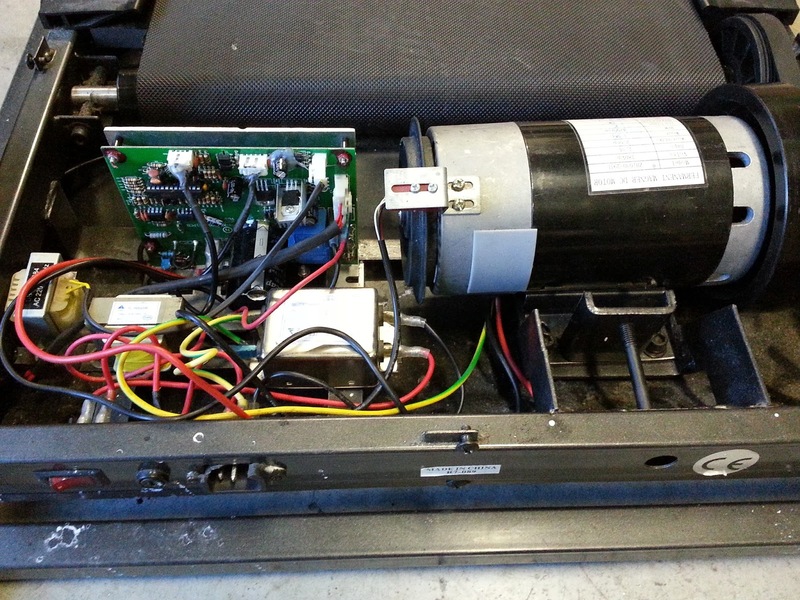 For treadmills with DC motor (the most common for household), if you can measure with a current probe or an ammeter the output current from the controller. If the value reaches at least the 5A, the controller is OK and the fault is in other components. Another test that you can do is to bring the treadmill up to max speed without anyone on: if the controller is OK, it should reach full speed. This test could also fail due treadmill engine damage or problems in the speed sensor. Finally one last suggestion, the controller should be replaced in the case does not bring any voltage to the motor output (symptom: the motor does not move) or is shorted (symptom: the motor is at full speed and you can’t adjust it). To do this test is advisable to connect a bulb to the outputs M+ and M- of the controller instead of the original engine. By starting the treadmill and pressing + and – speed, it should be possible to adjust the intensity of the light bulb for a few seconds. If the bulb does not light or lights fully and you can not adjust the brightness, then the controller it must be replaced.